ItemF-03355 - Views along the Yukon telegraph line; Atlin-Quesnel section. ItemF-03360 - Views along the Yukon telegraph line; Atlin-Quesnel section. ItemF-03378 - "Moose Lake; Atlin-Quesnelle tel. line." ItemF-03387 - "Atlin-Quesnelle tel. line." ItemF-03388 - "Dom. Gov. storage tent, Stikine River; Atlin-Quesnelle tel. line." ItemF-03391 - "Atlin-Quesnelle tel. line." ItemF-03392 - "Wire gang; Atlin-Quesnelle tel. line." ItemF-03395 - "Setting poles; Atlin-Quesnelle tel. line." 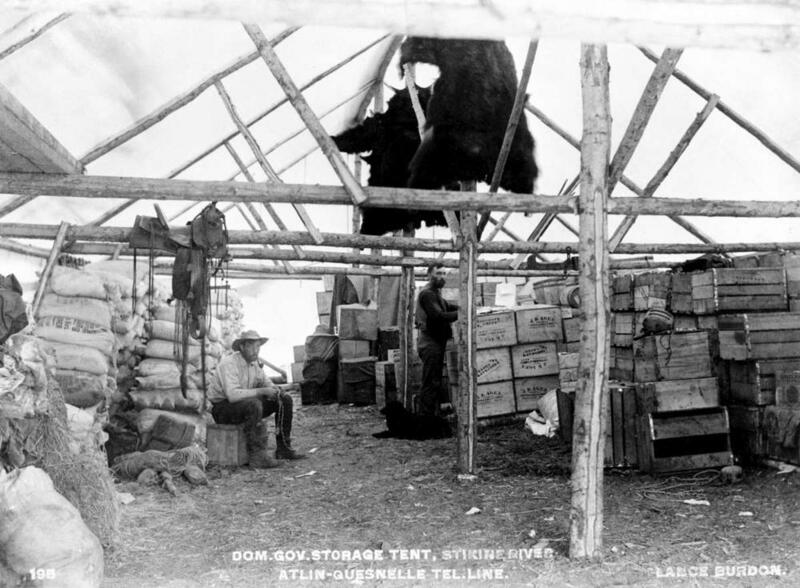 ItemF-03396 - "Raising telegraph poles; Atlin-Quesnelle tel. line." Item F-03388 - "Dom. Gov. storage tent, Stikine River; Atlin-Quesnelle tel. line." "Dom. Gov. storage tent, Stikine River; Atlin-Quesnelle tel. line."